As HH&H's President of the Board of Directors, Kelli is always striving to learn more. She volunteered at Wildlife Rescues since 2006, taken classes at UC Davis's California Raptor Center, the University of Minnesota's Raptor Center, and the World Bird Sanctuary. 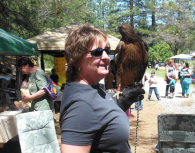 She has always had a passion for animals, from the long-ago days of catching pollywogs and lizards to today – learning to train birds of prey to work with people in educational programs. Most of her young life, Kelli lived in the southern part of Silicon Valley, back when there were still orchards to explore and hills to climb. She was always fascinated by the great outdoors and the animals that lived there. And she was very fortunate that her parents allowed her to have mice, birds, dogs, and cats (She never did tell them how many lizards and frogs she kept in her room!). Kelli vividly remembers her first trip to Marine World, watching those lucky people work with lions, tigers, dolphins, and raptors, and wished she could grow up to be just like them! As she grew into a young adult, other passions (softball) and, yes, responsibilities (college and work) took precedence in her life. After obtaining a teaching degree, Kelli went back into the field to work as a carpenter, later using her educational knowledge became a Safety Manager for a general contractor. In the late 1990s, she had an opportunity to move to Sacramento, with no idea how wonderful that would be and how it would change her life. Almost immediately, she trained as a Park Ranger, and got involved with a local Wildlife Rescue group to learn rehabilitation, and joined their Education Team. At last, she was able to realize her dream of working with birds of prey! And now, with some grand people around her, she has a fantastic opportunity to do something that she loves in an area that is unique and wonderful. Here's hoping you will love it, too. All her life, she had an interest in the wonderful world of animals and in learning as much as she could about them. This led to an adventure in the field of veterinary medicine and all of the opportunities that has presented to her. Graduating from the Ohio State University in Veterinary Medicine in 1982, Dr. Carol practiced small-animal medicine for several years and then, in 2001, purchased the Cat Clinic of Folsom. She is still in awe of the wonders of animal life and, five years ago, she joined one of the local wildlife rehabilitation groups and began to assist in caring for injured wildlife. Currently, her Cat Clinic functions as a drop-off point for songbirds, raptors, and waterfowl that are in need of immediate care. Dr. Carol is HH&H's Vice President of the Board of Directors and is officially the Vet of Record, but she wears whatever hat is needed. exposed her to chickens, ducks, birds, rabbits, goats, cats and dogs,Nancy’s first full time job was working with animals at a Veterinary hospital in Toledo, Ohio. Entering the military gave her an opportunity to see Europe and various cities within the U.S., including Southern CA. After an Honorable Discharge from the military, she returned to Southern CA where she lived and worked until retirement. 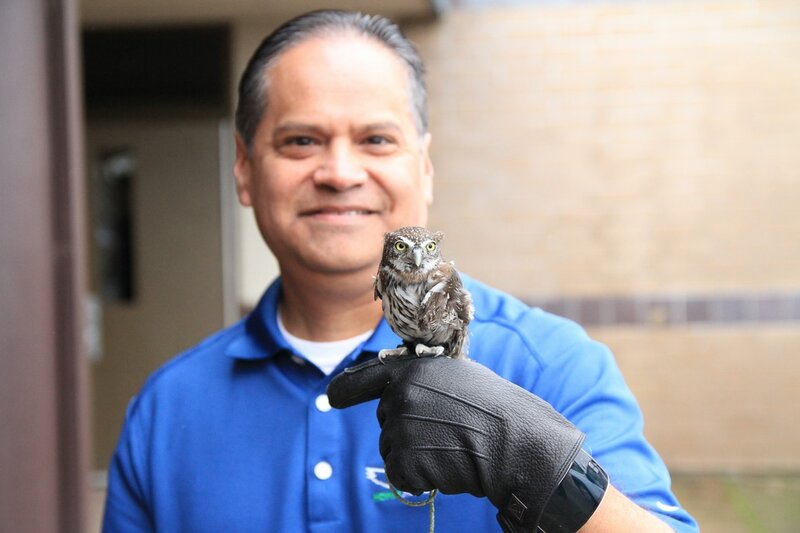 Ralph Cortez, Member - Ralph first met HH&H during the 2015 Galt Winter bird Festival and was hooked by the owls and other fascinating birds of prey. After watching Kelli’s presentations and seeing how professional she and the birds were along with her attention to detail in audience interaction. I knew I truly had a passion and deep love for these awesome animals. I had to learn more and before you knew it had the duties of driving our ladies & precious birds to presentations all over the bay area and one trip to Falon, Nevada. I’ve slowly gained knowledge of HH&H’s mission and looking to be more involved with handling our birds during future presentations. Jeanette Hess, Member - Jeanette’s love of nature and wildlife was nurtured growing up along the coastal cliffs and inland valleys of San Diego. Her childhood was spent camping and exploring the Western US with her family, which extended well into adulthood. Jeanette spent her professional career in healthcare spanning 32 years as a Respiratory Therapist and Pulmonary Nurse Specialist with Sutter Health and UC Davis Health System. She also served as a flight nurse in the USAF, 349th AES Travis AFB, CA. In addition to her love of birds of all kinds, Jeanette is an accomplished musician playing flute, saxophone and Scottish bagpipes. Jeanette is thrilled to be part of HH & H, and is looking forward to gaining the skill and knowledge to work with this amazing team of handlers and bird ambassadors.